Rocky on my shoulder for the first time ever! 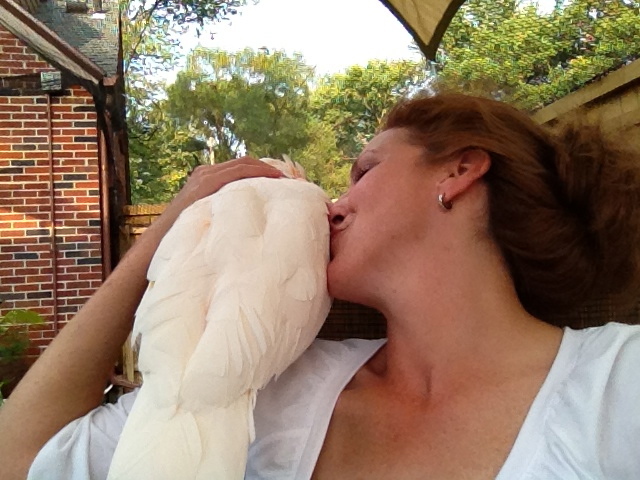 Lara Joseph; Avian Behavior, Training, & Enrichment Facebook page a photo of Rocky, my almost 13 year old moluccan cockatoo on my shoulder. What is the big deal about this photo? The fact that Rocky is on my shoulder. Rocky is a re-home that came into my life almost five years ago. He came to me from a shelter with a plethora of behavior issues and was highly suggested to me that he be euthanized for his level and intensity of behavior issues. Five years ago when I began interacting with him I was not able to get him out of his cage without a bite or obvious signs of aggression. Through consistent training and use of applied behavior analysis and positive reinforcement training over the past five years, Rocky is many things including one of the most well-behaved birds in my house and has just, for the first time ever, perched on my shoulder. 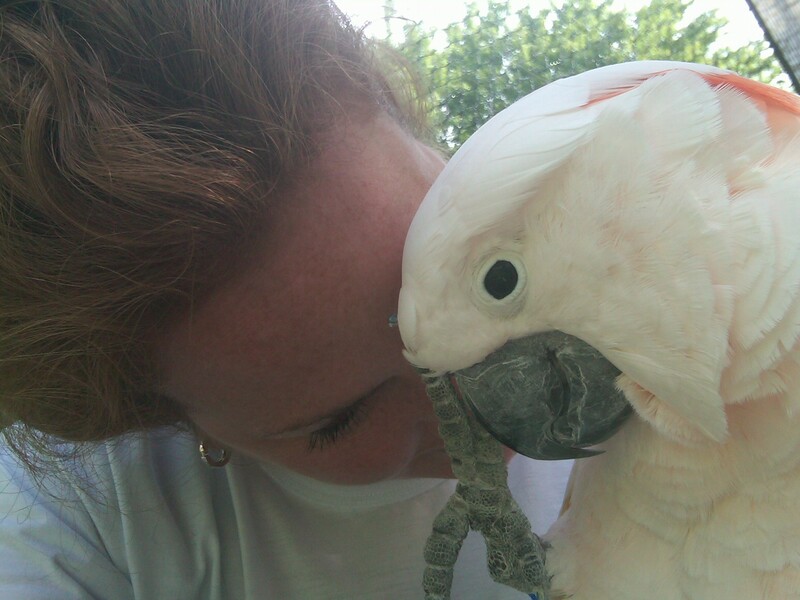 I hear cockatoos (in addition to many other parrots) getting labeled with names such as psychotic, unpredictable, hormonal, out of control, and yes, even vicious. I also hear them labeled with names such as cuddly, loving, needy, velcro birds, and very trusting. I don’t want this to be an entry about cockatoos. My intention is to have this be an entry about behavior, the procedures taken in changing behavior, and the fall-out with using labels. Labels are descriptions given to describe, in this instance, birds. The problem with labels is that they can cause a lot of harm to the bird and its future. If a bird is labeled psychotic, many times it will cause people to not interact with the bird. The way I was taught was to describe what the behaviors look like because once you describe what they look like, you can then work on identify what is causing them. The objects or events that cause the undesirable behaviors to maintain or increase are called reinforcers. Once you identify these, then work can begin on changing the behavior and when behavior is changed from undesirable to desirable, it helps keep the bird and the caretakers happy in living together with less chance of the bird losing its home. Labels almost cost Rocky his life. Birds are not hatched with all of these behavior problems and labels. They learn these behaviors through experience and observation. When they know what actions they make get them the reactions that work in their interest, they most likely will try exhibiting those actions again in the future. 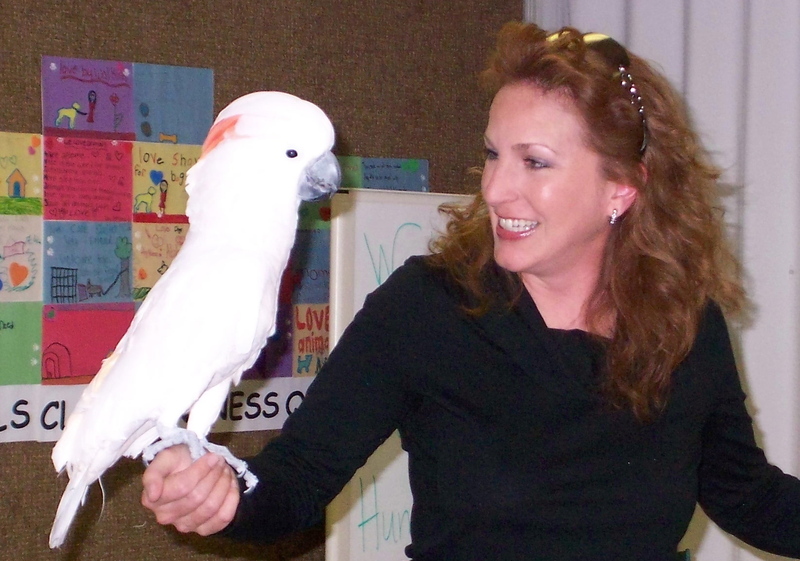 Training is learning and communication and birds are knowingly or unknowingly trained to behave much in the way they do. Training is always happening the question is, what are we training? A strong and trusting relationship built through positive reinforcement interactions. The longer a bird has to learn and repeat or refine behaviors, desirable or not, this is called a history of reinforcement. When I first brought Rocky home almost five years ago, I could tell his screaming probably had a long history of reinforcement. Generally the longer a behavior has been reinforced, the longer it will take to change the behavior because the bird has had such a long history of having that behavior serving some value to him or her. With observation I could tell Rocky was screaming for attention and from how strong and persistent he was with his screaming, I could tell the screaming had a long history of reinforcement. By no means did nor does this mean this behavior can not be changed. Five years later, Rocky rarely screams. In the beginning he screamed for several hours a day. With consistency and efficient use of differential reinforcement, I was able to see progress in change within a few training sessions. This doesn’t mean the screaming ceased in a few days. It took quite a while be able to get through a day without a scream, but when we did, it was nothing short of awesome and very reinforcing for me to continue interacting with Rocky in changing this behavior. Each bird is its own individual just as the behavior exhibited. The amount of time it took me to begin to see change in Rocky’s screaming could be different from bird to bird and from caretaker to caretaker. The methods used can be the same. I hear several people say “All of a sudden my bird started (insert behavior here)”. If this is a behavioral issue, more than likely the behavior has been reinforced for a while. When behaviors issues are undesirable and intense consistently is usually when awareness is usually emphasized. Often times the undesirable behavior issue was unknowingly reinforced once in a while for a long period of time before it has reached intensity to where someone or another animal gets hurt or the behavior is unbearable to live with. When changing behavior, I have found it often takes a shorter amount of time to change the behavior than it took to unknowingly teach it in the first place. Rocky at his first children’s program. including individualized. When I first brought him home and observed all of his behavior issues including chasing me and lunging at me, getting him on my shoulder was the furthest thing from my mind and actually I probably thought it would never happen. Over the past five years I have consistently worked on many different behavior issues with Rocky. I took the same approach in changing all of them and that approach was a procedure called shaping; reinforcing small approximations toward the target behavior. If Rocky was perched on the arm of a chair I was sitting in when I tried to get up or if he got behind me, he would lunge at me and pinch me with his beak. This is definitely a behavior I did not want to see increase or even maintain so I immediately began shaping a new and alternate behavior. That behavior was having him remain calm as I stood up or moved past him. I slowly positively reinforced him staying calm while perched near my elbow. Over time I was reinforcing him for staying calm as I slowly stood up. Over the past five years with our interaction between each other being primarily based on positive reinforcement, the behavior of him getting further and further behind me or further and further up the arm of my chair was constantly changing. Instead of lunging he would wait for me to give him praise and scratch the back of his head. As you see in the photos Rocky and I now have a strong and very trusting line of communication and relationship built through positive reinforcement. All behaviors aren’t for all birds and for all households. Each bird, history of reinforcement, and behavior being trained or modified is as individual as you and I and should be treated as such. Rocky was a diamond in the rough. He is such a treasured jewel in this household and with those that have had the pleasure of meeting him agree. He has been one of my best teachers and I will always thank him for that.